I made this one night when Sean and I were desperately hungry, but wanted minimal effort. We had put chicken in the oven to cook, but wanted something to go with it. I had previously bought udon noodles, and hadn’t had a chance to use them so I thought something with that may be good. I scoured through my cookbooks trying to find a simple, but achievable recipe. I flipped through the Steamy Kitchen Cookbook, the Cooking Light Way to Cook: The Complete Visual Guide to Everyday Cooking, and then I finally settled on a recipe from the Veganomicon. The Veganomicon seemed to have answered my cooking wish: it gave me a stir fry that was full of delicious veggies, and had udon noodles! While the original recipe is vegan, I didn’t make a vegan stir fry (obviously) due to my inclusion of chicken and chicken broth. I would have gone vegan, but this is what I had on hand at the time. So my apologies to anyone who may be offended by the non-veganification of a vegan recipe. I don’t want to give the impression that I don’t feel food is tasty unless there is meat. I love vegan food, and I hope that shows on my blog. I’m going to post the original vegan recipe, and then next to it in bold the adaptations I made. Keep in mind this was heavily adapted based on what I had in the kitchen. Pre-cook the udon noodles according to the directions. Drain and then rinse with cold water to stop the noodles from continuing to cook. Combine the flour and peanut oil in a small saucepan on medium heat. Stir constantly with a wooden spoon until the combination turns a caramel brown, and smells toasted. Add the garam masala and the curry powder to the flour and oil. Continue to cook for 1 minute, before adding the vegetable broth. Once the broth is incorporated, whisk the sugar into the sauce. Cook the sauce until it thickens, approximately 2 minutes. Remove the sauce from heat and set aside to use for the stir fry. After the curry roux sauce has been made, heat the peanut oil in a large wok or skillet. Put your onion into the oil and allow it to cook until translucent and soft. Add your ginger, seitan, red bell pepper, and hot chile. Stir fry for approximately five minutes, then add your broccoli (I added carrots here too). Stir fry the broccoli until it turns vibrant green, approximately 4-5 minutes. Add the udon noodles to the stir fry, and sprinkle with the soy sauce. Stir fry for 2-3 minutes. Add the 1/4 cup of vegetable broth to the curry roux to make the sauce less thick. Pour it over the stir fry and then continue to cook for another 2-3 minutes, ensuring that everything is covered in the sauce. (I added the red pepper flakes at this point). Once the sauce begins to simmer, and the noodles are warm: serve. 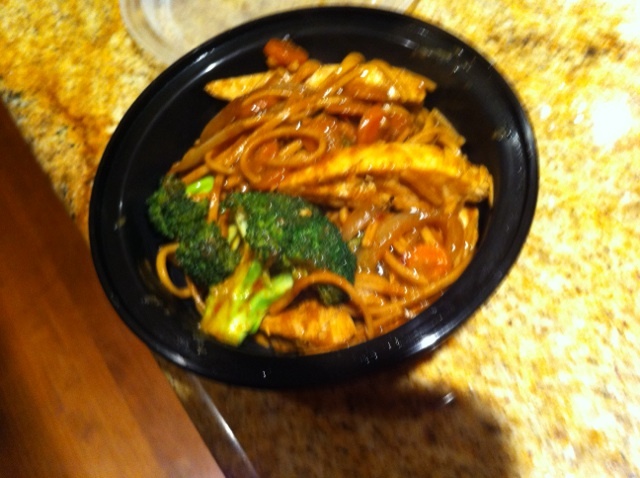 This stir fry was awesome. I took it for lunch the next day. I was a bit wary of the curry roux because I felt like the flour may be too intense (I feel like whenever I cook something and it has flour in it, it’s all I can taste for some reason). The udon tasted better the next day. It was really simple, and really tasty. I generally feel intimidated by stir fries because I feel a little intimidated by how fast everything cooks. This is really a case where you need to prep ahead before beginning. Thankfully everything turned out well and I worried for nothing! This looks delicious, I’ve been looking for a recipe I can use udon noodles in! I appreciate your comments about dishes not needing meat to be delicious, thanks for your open-mindedness. Can’t wait to try the orig. Veganomicon recipe!